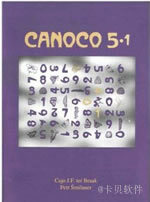 新版本随每个新许可证附带了重新编写的手册。 免费更新包含Canoco5 / pdf文件夹中的pdf，其中包含Canoco 5.1中的主要更改. 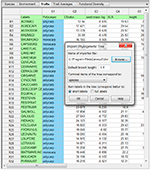 Analytical and graphing capabilities are integrated with an easy-to-use spreadsheet data editor in a single program. 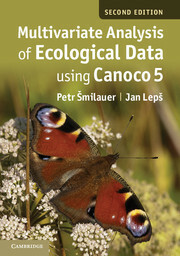 All analyses done on a set of data tables are now collected within a Canoco 5 project, sharing the analytical and graphing settings. 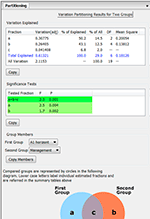 All statistical methods offered by Canoco for Windows 4.5 are available, such as DCA, CA, CCA, DCCA, PCA, and RDA methods - including their partial variants, with Monte Carlo permutation tests for constrained ordination methods, offering appropriate permutation setup for data coming from non-trivial sampling designs. For newly available methods see below. 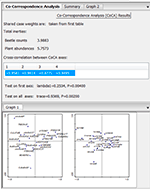 All visualization tools offered by CanoDraw 4.x are available (including loess, GLM and GAM models for the visualization of data attributes in ordination space) and many of them are improved. Data can be entered within the program itself or easily imported from Excel (.XLS or .XLSX formats) or from Canoco 4.x data files. Labels no longer need to be shortened to 8 characters, but these brief forms are still available for display in the ordination diagrams and can even be automatically generated from the long ones. Standard coding of factors (categorical predictors) is now used, dummy (0/1) variables are generated internally. The editor allows transformation from dummy variables to factors and, if needed, the reverse. Principal coordinate analysis (PCoA) and distance based RDA (db-RDA) are now easily accessible, with new distance measures added (11 distance types in total, including Bray-Curtis, Gower distance, or Jaccard coefficients). Similarly, non-metric multidimensional scaling (nMDS) is also supported. 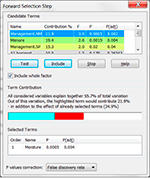 Variation partitioning is easily accessible for two or three groups of predictors including calculations of individual fractions of explained variation, based either on partial or non-partial analyses and using either raw or adjusted variation estimates. Principal coordinates of neighbour matrices (PCNM) method is available within the variation partitioning framework. Present implementation matches the suggestions described in Legendre & Legendre (2012) under an alternative method name (dbMEM). Computing, testing and graphing of the Principal Response Curves (PRC) is now an easy task. Co-correspondence analysis (CoCA, symmetric form) is available, including Monte Carlo permutation testing of the covariation among the two compared community types. Stepwise selection of predictors was visually enhanced and provides now the support for protection against Type I error inflation (preliminary test with all predictors and the adjustment of p values by one of three methods:false discovery rate (FDR) estimates, Holm correction, and Bonferroni correction. Straightforward testing of all constrained axes as well as comparing results of two ordinations with Procrustes analysis is available. You can easily work with species functional traits or import the data on phylogenetic relatedness of species, as well as calculate and use functional diversity. Visualization capabilities were enhanced with features such as the semi-transparent fill colours, displaying calibration axes for variable' arrows in ordination diagrams, or plotting enclosing ellipses as an alternative to enclosing polygons. Additional types of export in JPEG, TIFF, and PDF formats were added to existing ones (PNG, BMP, EMF, Adobe Illustrator). 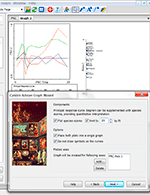 Every step of your work is supported by an context-sensitive help system and by the Canoco Adviser �C an expert system that helps you to select a proper analytical method for your research question, correct type of ordination model (linear vs. unimodal), data transformation, or appropriate visualization of the results. It even advises you how to interpret ordination diagrams you create with the help of Graph Wizard. Advanced users can combine multiple methods in a single analysis, including generalized linear models to correlate scores etc.